i wish i had a more condensed name for these, but unfortunately i was too hopped up on SUGAR and JOY to come up with one when i wrote this post. these, my friends, are heaven on earth…in your mouth. 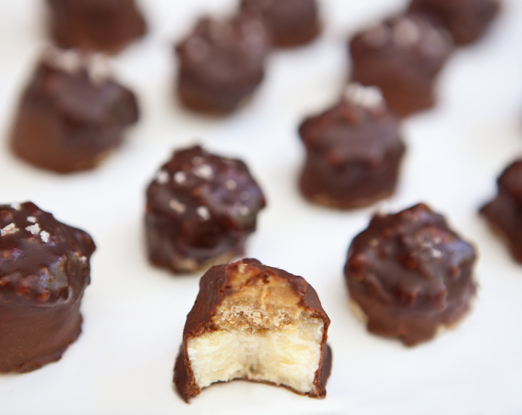 sweet, salty, chocolatey OMGoodness. they’re more work than my average recipe, and especially challenging because you can’t have a craving and whip them up all impulsive-like. you have to crave them, start making them on night one, and then MAYBE, if you’re lucky and your freezer works well, be able to enjoy them the next day at lunch. but i promise you, you will be so SO happy when you do. the night before: prepare peanut butter filling by mixing earth balance vegan butter, sugar, graham cracker crumbs and peanut butter in a pan and melting together. Once thoroughly mixed, let cool and then place in a bowl in the fridge to harden for the next day’s banana sculpting extravaganza. 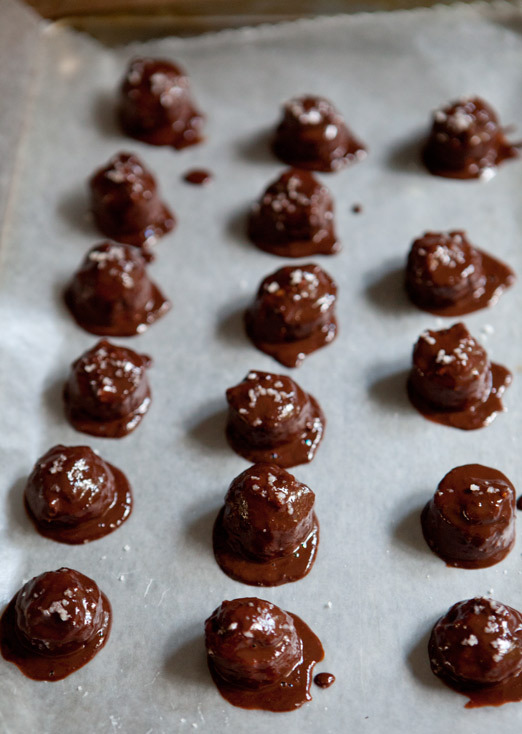 – i set up a production line for this next part at our dining room table with all my peanut buttered bananas on my left, the pot of melted chocolate directly in front of me (DANGER!) and the wax paper covered cookie sheet to my right. – place a banana slice on your fork and then dip into chocolate (do not spear the banana). use a spoon to pour melted chocolate over top until all of the banana and peanut butter are covered. 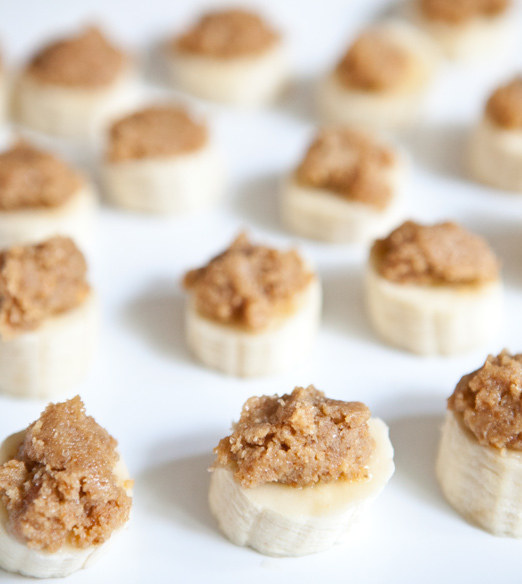 – once all of your banana slice have been coated, sprinkle each one with sea salt and pop them into the freezer. once they’ve hardened you can transfer them to any freezer safe container. eat them freely! OMG is right! This sounds delicious! Whoa. Whoa. WHOA. I'm sold! These look amazing! Do you think this would still work if you jut used straight peanut butter instead of making the sweet PB filling (which sounds amazing, but just for reduced sugar and hands on time sake)? What happens with the graham cracker crumbs? @sam, eek, i forgot to mention that they go in the peanut butter topping… just revised the recipe. good eye!! Scrumptiously delicious, will try very soon! What an awesome recipe. Kudos to Sarah!!! It’s late but I may have to run and raid the grocery store tonight. Thought of something when reading through this–only because I’m dexterity-challenged now. I wonder if the small end of a “melon baller” (2 bucks) would work to scoop out the p-nut butter filling? I may try that–they are great little gadgets to have around. Salivating already!